When I first began homeschooling I will admit I was a little bit addicted to curricula. I loved to go to Mardel or other stores that carried a plethora of learning resources, supplies and curricula. I would browse and usually find something that I thought we needed. As a new homeschooling mom, I thought, the more curricula, the better. After all, I had no idea what worked best for me or my children and we needed to figure that out. When Luke was 4 years old, I could see he had a big love for learning, so my solution was to start a formal Kindergarten Curriculum with him. The curriculum I chose was mostly a bunch of fun games that helped him learn reading and math. 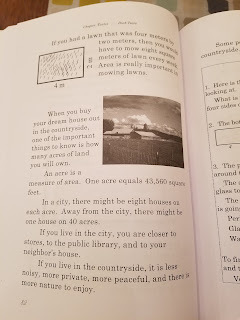 In addition, Luke, Abbey and I had already been using the Five in a Row curriculum together to learn math, language arts, science, geography and social studies through literature. While we still use the Five in a Row Curriculum (which I highly recommend for everyone---no matter what learning style--see the end of this blog post for more about it), we have deviated far from the other original all-in-one curriculum we used. There was absolutely nothing wrong with it. We just realized that, although I have a very type-A personality, I didn't like rigid curriculum that locked me into doing certain things each day. I realized we wanted our "school" to be much more fluid and relaxed. I realized that, in the beginning, I was trying to replicate the very thing I was trying to stay away from: conventional schooling. The beauty of homeschooling is that I do not have a class of 25 kids, and therefore, my "school" can be completely different (and should be) than a public school class. My kids can learn what they want, when they want, however much they want and not have to worry about staying with the rest of the class. We go at my kids' pace. So now I have two rules with our "schooling": we will do a TON of reading each day and we will learn math (at their own pace). The rest of the stuff that happens in our day is just fun learning that happens naturally--and a lot of it happens in nature. 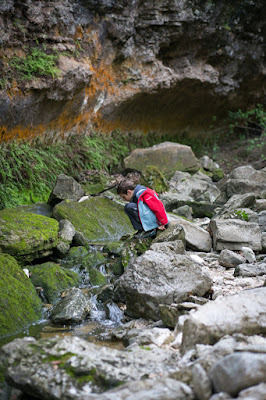 I supply lots of resources for the kids to learn and explore on their own. When I give them a kit of magnets, they think they are playing, but they don't realize they are also learning a lot about the scientific properties of magnets. When they ask to play Zingo (sight words) or a math dice game, they don't realize how much they are learning. But I do. This is also why there is absolutely no need for testing in a homeschool situation. Testing is necessary when a teacher doesn't know what knowledge a child has retained and has to determine if they can stay in their current grade level or get to move onto the next level. But, I can tell you exactly what my kids know, because we have such a close relationship and I know their strengths and weaknesses. And, we have absolutely no use for "grade levels" in a homeschool situation. We have no need to categorize our children in this manner. Luke has finished every level of our reading, writing and phonics curriculum (which was Explode the Code). The curriculum goes through the "4th grade" level (for traditional school comparison). Just out of curiosity, I tested him to see what school "reading level" he would be at. I found out he and Abbey are both reading at a 6th grade level. So, what sort of curriculum should I do next? In my opinion--absolutely no formal "curriculum". Many would be shocked to hear that we aren't planning on using any sort of "English" or Grammar curriculum. But, if the kids are reading a ton every day, won't they learn how to form sentences and write? Isn't that the purpose of learning grammar? Well, that is our plan. We will continue to do lots of reading and creative writing. We will do reading comprehension exercises. We don't have a formal "history" curriculum either. We will check out lots of books (no textbooks) on various historical topics. The types of books we use in our learning are "living Books". According to "Simply Charlotte Mason", living books are usually written by one person who has a passion for the subject and writes in conversational or narrative style. The books pull you into the subject and involve your emotions, so it’s easy to remember the events and facts. Living books make the subject “come alive.” They can be contrasted to dry writing, like what is found in most encyclopedias or textbooks, which basically lists informational facts in summary form. We carry this over to math and science as well. 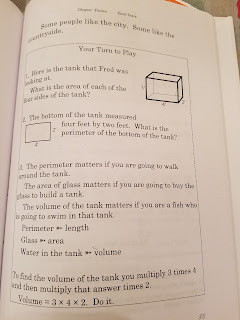 Our Math curriculum is "Life of Fred". Each text in the Life of Fred Curriculum is written in the style of a novel with a humorous story line. 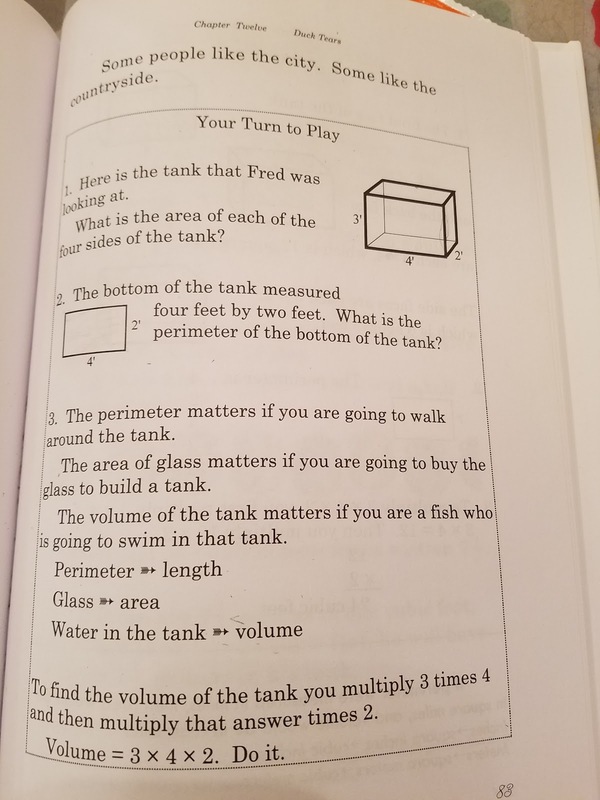 Each section tells part of the life of Fred Gauss (a 5 year old college math professor) and how, in the course of his life, he encounters the need for the math and then learns the methods. We absolutely love this curriculum. We will continue to do tons of fun science experiments together and read lots of books on scientific topics. 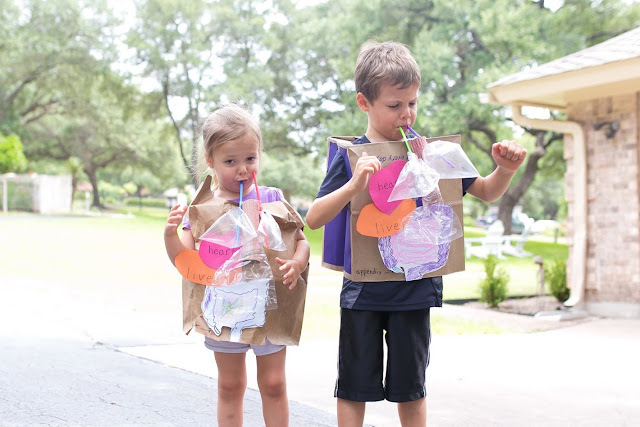 We absolutely love "The Magic Schoolbus." We have been reading the chapter books together since Luke was 4.5. We just recently discovered shorter versions of the books, that have tons of pictures and the kids can read in one sitting. It is amazing how much the kids can learn about science in that short amount of time. We also subscribe to "The Young Scientest" program through the magic schoolbus. Each month, they send us 7-9 experiments to do one a specific scientific topic, such as "Acids and Bases", "Magnets" and more. We can check out books and watch dvd's that go along with those experiment kits as well. We will learn about technology in a hands on manner. We will continue to program our robot, Dash. We will also continue to explore the outdoors every day. 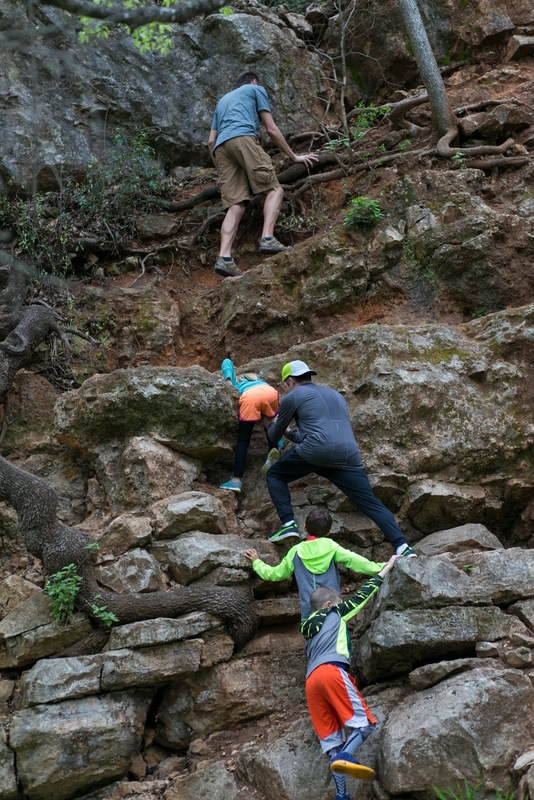 Some of this exploring will be done through the "Wild Explorers Club." But, also, we hike very regularly, both with our Hiking club and on our own. Luke played a game where we sorted objects that we said goodnight to in the book, "Goodnight Moon" vs. those that we did not say goodnight to. This was a great memory game. This picture makes me chuckle. In Madeline, she has to have surgery to remove her appendix. So, we learned some anatomy while rowing this book. The kids colored their intestines and we cut out other body parts as well. We also added to plastic baggies to the end of straws to show how our lungs inflate when we breath air in. There is one more baggie at the end of our esophagus that is supposed to be the stomach. And here is a recent "row" we did with Ferdinand. Both kids are doing some exercises that are early versions of character maps. 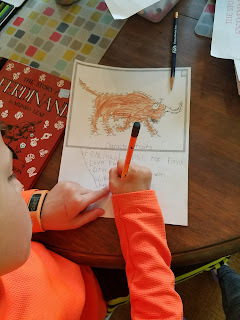 They each did a connect the dot page of a bull and then wrote some character traits of Ferdinand the bull. Here is a video of Abbey reading "Ferdinand." 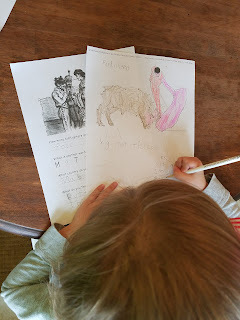 Also, we did a bull craft and then used the bull we made to "re-tell" the story of Ferdinand. This we found was a fun way to work on reading comprehension. 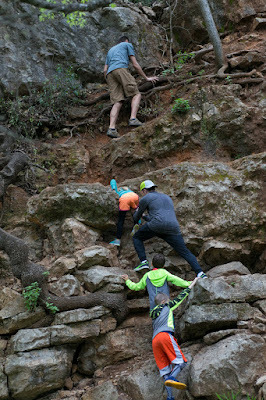 The kids did some other fun activities as well. We did several writing exercises that they enjoyed. 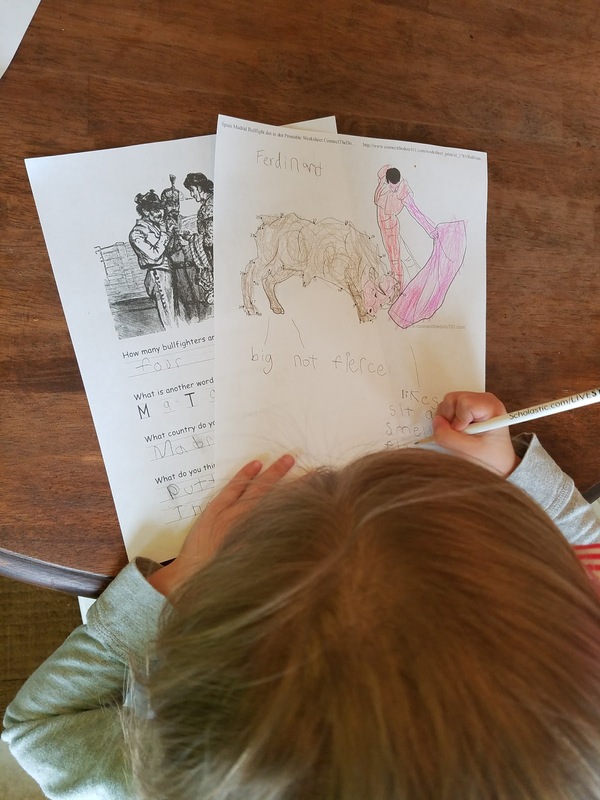 In the free lapbook from the homeschool share site, we printed a worksheet that showed a picture of four bandoleros discussing something and the kids had to write what they thought they were talking about. We also learned all about Spain in our geography lesson, it's capitol city, Madrid, and watched some videos on youtube about Bull fighting. The learning went on and on. We had so much fun. We still have many books to row through using the "Five in a Row" curriculum. And after we have finished though, the good news is there is more. They also have a "Beyond Five in a Row" curriculum. Here. when we were rowing "A Pair of Red Clogs", we took a little trip to Japan (in our home). We had a Japanese tea in our "kimonos". If you go to the http://www.homeschoolshare.com/ website, you can search for any of the Five in a row books and download lapbooks for free. There are also many other unit studies on their website. We can cover so many subjects while rowing the various books. We usually take a couple of weeks to cover one book. For example, as we were rowing Ferdinand, we realized there were also unit studies on cattle, Spain and Vultures that would have gone along well with the book. There are just so many fun things we can do along with the books. I have one major goal as teacher of my kiddos, that is sort of two-fold. First, I want the kids to really enjoy learning-- I want it to be super fun. But secondly, I want them to love it so much, that they want to learn something new everyday and figure out on their own how to be resourceful and learn about anything they want to learn about! And I think with our very literature, living book and nature focused education, this goal will be accomplished. (And just a side note, but my kids also get a TON of time with other kids during the week as well. 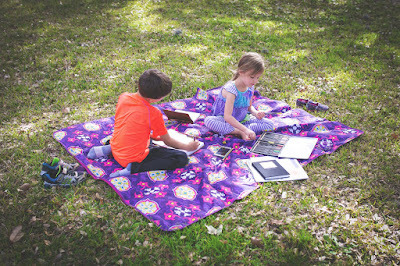 They attend a one day homeschool enrichment academy, attend choir, Abbey attends a homeschool gymnastics class, Luke is in Baseball, we have Lego club with friends, many field trips with friends, hiking club, and SO much more. My kids are extremely social kids and very well socialized in my opinion).